Randazza provides complete Design, Fabrication, Manufacturing, Supply of Equipment, Installation, Commissioning and Personnel Training. 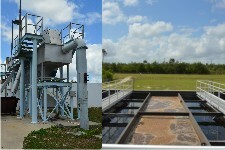 Randazza Enterprises, Inc. specializes in Advanced Wastewater Treatment Solutions for Municipal and Industrial customers. Each project is custom designed to meet the individual project’s specific needs, based on the Design Criteria and Effluent Parameters. We work with Owners, Consulting Engineers, Contractors and Design Build Teams to provide technologically advanced patented and proven systems for complete wastewater treatment facilities. Randazza finds solutions for new plants, retrofitting existing facilities, water reclamation and facilities in environmentally sensitive areas. Using the Award Winning and Patented ECOfluid USBF™ Upflow Sludge Blanket Filtration System and Fontana Wastewater Treatment Equipment, with hundreds of plants in operation worldwide and proven to consistently deliver high quality treated effluent in a variety of applications. © Copyright 2012 Randazza Enterprises, Inc.